This try surface crochet stitch is surprisingly easy to do and you will have a number of ways to use this stitch. 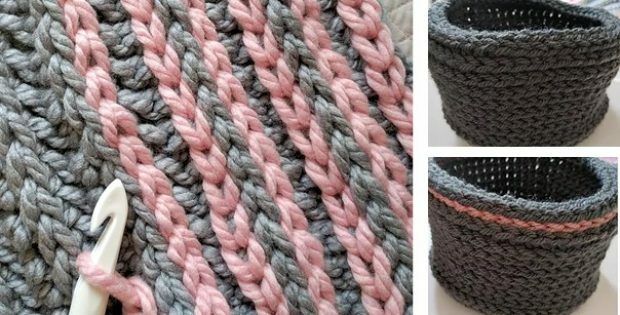 Add stripes, ribbing, edging, more colors and endless decorative applications to any plain crochet projects using this method. Doing this stitch simply involves adding a stitch on top of a piece that is already worked up. Even beginner knitters will be amazed at how the finished work will look without putting in much effort. The steps in the crochet pattern provides basic instructions to do this stitch. This works exceptionally well in the round and would work with any crochet stitch. Michelle who runs the The Snugglery website is the designer behind this very simple yet useful crochet stitch. Access the FREE pattern for this handy surface crochet stitch and start learning this method. To access the FREE crochet pattern for this very versatile try surface crochet stitch, click here: Surface Crochet Pattern. Featured image(s): The Snugglery – thank you!